Calling all hopeless romantics. The fertile crescent might just be on the island of Sicily. ERICE, Sicily – I had been trying to get pregnant for six months when my husband and I visited Sicily to celebrate my nonna's 85th birthday. It seemed an appropriate time to indoctrinate him into the world of my father's hometown, Sciacca, and the many characters, churches, and more that had become the legends of my childhood. There was also a very important stop I needed to make: the site of the in Erice, a walled medieval city about an hour and a half from Sciacca. The Elymians (they touched down in Sicily before the Greeks — trendsetters) erected a temple dedicated to love and fertility that served as sacred ground for fertility rites and ritual prostitution for multiple civilizations who passed through the mountains there: Phoenicians, Greeks, Romans. According to some sites on the Internet, those looking to conceive could do worse than spend time at this wondrous spot. All I mentioned to my husband was that it had beautifully preserved ruins and incredible views. 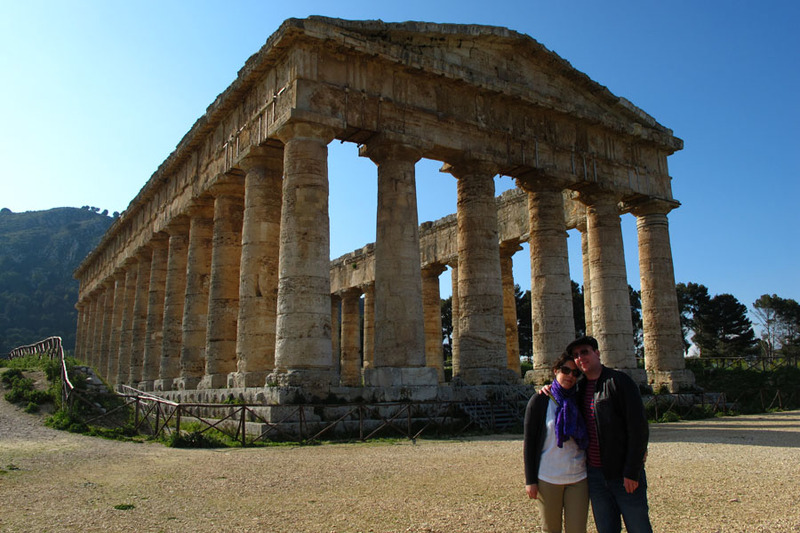 We traveled to Italy with my parents because visiting Sicily without my father in tow is unthinkable. Evenings were filled with dinners and piazza strolls, and we visited the in Agrigento together, enjoying espressos al fresco amidst the cypress trees planted by the ancient gods. I knew it would be tough to ditch them and make our way to Erice, but there was no way I was taking my parents on what was essentially a mythological mission to get our reproductive act together. If I remember correctly, I sprung it on my mother and father rather suddenly, when they were feeling ready for a siesta, woozy from the red wine at lunch. “We’re just going to hop in the car and drive,” I said, trying my best to be vague. Somehow we escaped and wound our way through the highways of the coastline. 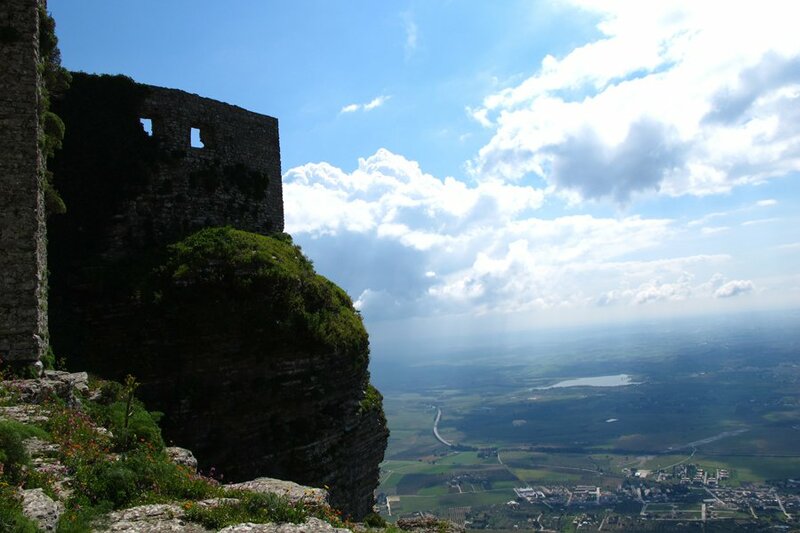 Arriving at Erice is akin to mounting a stairway to heaven. Its altitude means there is almost always a cloud mass clinging to its craggy profile. You must stroll past alluring pastry shops boasting marzipan Ninja Turtles and odd souvenir stands hawking toys like Creepy Mice on Wheels — teensy white mice on teensy wheels. There are several beautiful cathedrals and churches and a long stroll to the sacred site, now occupied by a Norman Castle. I remember feeling a thrum of electricity run through me as we walked quietly up to the crest, with views of Trapani's salt pans in the misty distance. It was there that I confessed my secret plan to my husband, this visit to a hotbed of ancient female power. I think he found it charming; he's quite a romantic himself. Our drive home was quiet, and once back at my nonna's we explained that we got carried away and drove a bit farther than expected to check out some cool medieval spot we read about in our guide book. I never revealed my true intentions. The next month, I was pregnant. Now, whenever friends are struggling with conception, I email them a picture I snapped of the cobbled walkways high up on that hill and tell them to meditate on it. It's probably not as good as being there, but I think there's magic in it all the same. Biba is a freelance writer and pr consultant. She travels for the supermarkets, abandoned barns, and religious icons.